Looks amazing and delicious as always! I love the phrase to cheer up the kids! Such a nice touch :D I am sure they will have a great day! 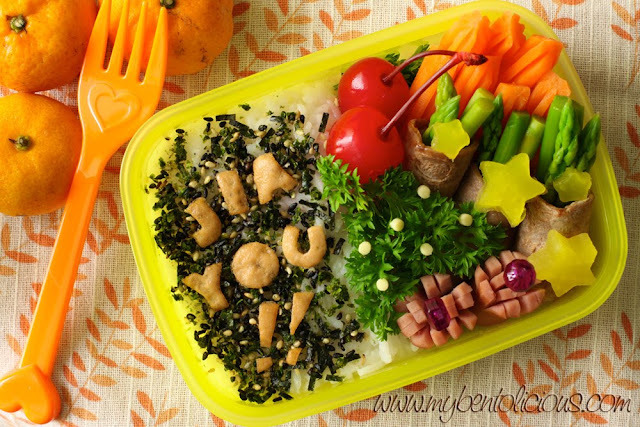 Pretty and colorful bento! I can't wait to see your snack bento! i loved the pork-wrapped asparagus bundles and the cute lettering. what a great way to provide encouragement! good luck to your kids! @megan : Thanks a lot Megan (^.^) 2 more days and the exam will finish, hope they really do their best.